NEXT SHOW - The Voice of Art Gallery / "New Juried Artist Members' Show 2019" - Reception on April 13th, 3-5 pm! Clinton A. Deckert is an award-winning Connecticut artist whose Dadaesque influences merge into abstract thoughts, colliding with surreal imagery to create a primordial stew where infinite possibilities evolve into works of fine art. Clint’s artwork is extensively represented in private collections, including several works in the acclaimed Jack & Susan Warner Collection in Alabama - considered by many to be the greatest privately held collection of American art in the world. Clint is also an art advocate who has served as a curator and juror in many regional art events and gives frequent artist talks, and critiques. 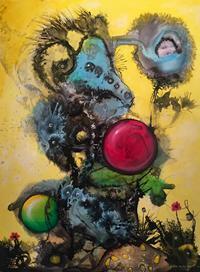 Most recently, Clint’s work was included in the Art Palm Beach International Art Fair in Florida. 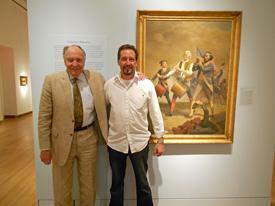 Jack Warner and Clinton Deckert, Spirit of '76 by Archibald Willard, at New Britain Museum of American Art, CT.